Diana Gamble's health-oriented articles have been published in magazines such as "The Natural Journal" since 2007. She earned certifications for massage therapy and nutritional consulting from the North Carolina School of Holistic Medicine. She graduated from the University of North Carolina-Asheville with a Bachelor of Arts in literature. If you are battling cancer, the healthiest option is to limit your intake of conventional sugar or sugar substitutes. This is not to say that you must eat bland food, either, because some natural sweeteners are actually healthy for you. Refined sugars or an excess of certain unrefined sugars may oxidize your body, which is not good if you are healing from cancer, so, if you must eat it, use it sparingly. Stevia is a sugar substitute derived from a sweet-tasting herb. Stevia is actually known to have antioxidant qualities, which help to prevent and fight cancer. The way it is derived determines how healthy and natural it is. Certain stevia brands are made using a simple water-based method of extracting the sweetness from the herb, while other brands like Truvia and PureVia are chemically extracted and contain rebaudioside A or “reb-A.” The Dr. Oz Show recommends you steer clear of any chemical ingredients for optimal health, so you may want to purchase naturally derived stevia brands that are available at most health food stores and online. Health foods sell date sugar in the baking area. 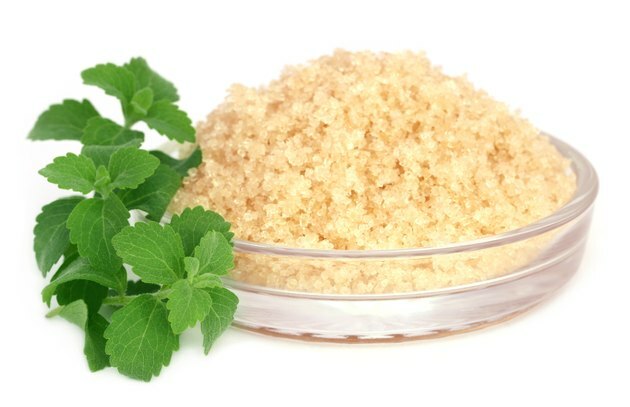 Date sugar is minimally processed and considered an unrefined sugar. It contains nutrients from the dates and is complementary in flavor to brown sugar. You can use pureed dates to add moisture and texture as well as sweetness to baked or raw sweet treats. Try to eat as much as you can raw to access the maximum amount of antioxidants and vitamins they offer to maximize your immune system and health. Use blackstrap molasses as a sweetener, because it contains a variety of nutrients like potassium, iron, calcium, magnesium and vitamin B6. These nutrients help with the blood cells and can lead to health benefits. Some reported health remedies include cancerous tumors, fibroid tumors, anemia, constipation, edema, heart palpitations, arthritic pain, joint pain, acne and anxiety. These health benefits may not be supported with scientific research yet. Blackstrap molasses can assist in cancer-related anemia, because it is an excellent source of iron, according to the National Institutes of Health. Is Agave Healthier Than Honey? What Are Healthy Ways to Sweeten Coffee?